Huge shout out to Caron Atlas, Arts & Democracy, for bringing the Climate Ribbon to Brooklyn! The #GetOrganizedBK Civic Festival took place on July 25 from 5-8pm at the Prospect Park Bandshell. The festival celebrated the great work being done by local community members and organizations. 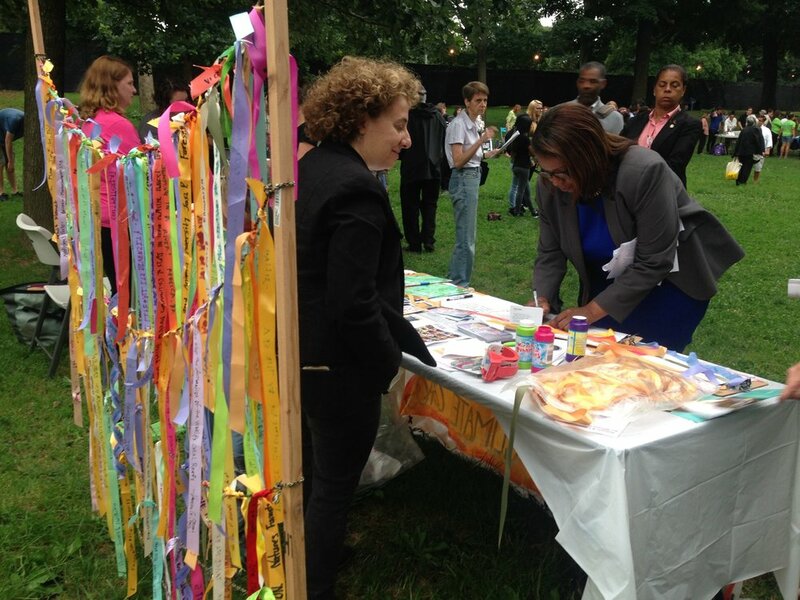 Around 1,500 Brooklynites were in attendance, and the Climate Ribbon was a moving part of the tabling activities. Councilmember Brad Lander, Advocate Letitia James, NY State Assembly members Robert Carroll and Jo Anne Simon made ribbons alongside many Brooklynites. Thanks Assemblyman Carroll for tweeting about the Climate Ribbon and thank you Councilmember Lander for posting about it on facebook! And thanks to Raquel de Anda for volunteering to help bring the Ribbon to Brooklyn! Thanks #GetOrganizedBK and thank you Caron!